You may remember the newborn photos of this lad that I posted about eight months ago (Maxim’s newborn shoot). Here are the images from the next shoot, a six plus shoot, one of the boutique baby photography shoots by Elen Studio Photography. This time, Maxim is around 8 months old, but what is important, he is able to sit unaided. He could not sit down by himself, of course, but once you position him, he is allright to sit and wonder around. And this is exactly what happened during this shoot. All the props were bought especially for this shoot: the suite, the wooden suitcases and special children’s guitar. 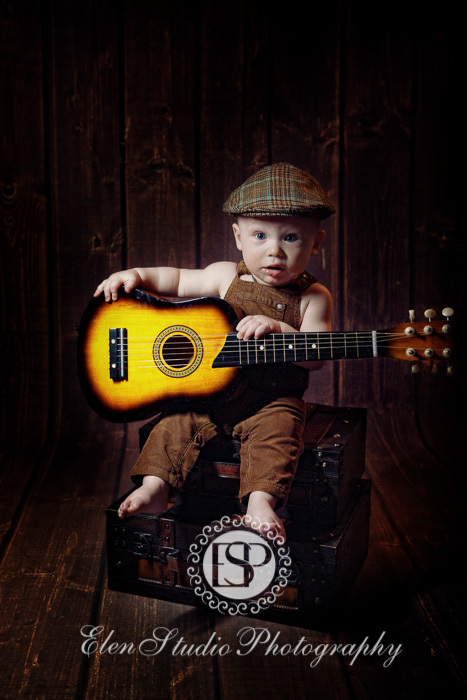 The guitar was important as his daddy plays guitar and I wanted to reflect this in the pictures. Who knows, may be this will make him a musician in the future?